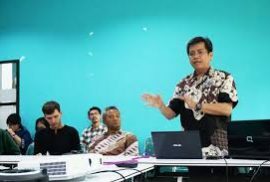 SEA Talk is a monthly discussion forum that discusses historical, social, political, economic, cultural, technological and human rights issues in Southeast Asia. 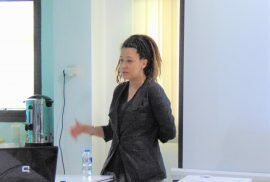 In each discussion, this forum brought in academics who had been doing research in Southeast Asia. 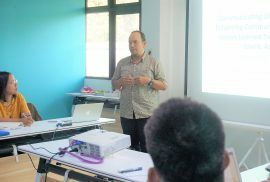 Some academics who have come to present their research at SEA Talk include communication experts Hermin Indah Wahyuni ​​and economist Rimawan Pradityo from Gadjah Mada University, to political and government experts Ronnie Hatley from Washington State University and anthropologist Judith Schlehe from Freiburg Universität. In a discussion forum on Southeast Asian studies, Ronnie Hatley delivered a thesis on the similarity or roots of tradition, culture, values ​​and language that united communities in Southeast Asia. 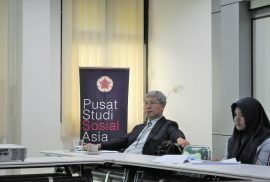 The discussion forum that brought Rimawan Pradityo and Herman Indah Wahyuni ​​to discuss economic themes and mass media, each of which examined the results of their research with the title Irony of the Corporate World in Indonesia and the Mass Media and Construction of the Asean Community. Interestingly, the scope of the studies discussed in the SEA Talk extends to various aspects. Professor Judith Schlehe, an anthropologist from Germany once presented the results of her research entitled Student Mobility & Knowledge: Indonesian Azharities as Cultural Agent. The variety of topics discussed in SEA Talk is a manifestation of our goal to distribute knowledge to the general public. Therefore, a monthly discussion forum at SEA Talk is held free of charge. With the free discussion forum that has various topics and scientific perspectives, we hope that the general public can be better prepared to face the complexity of life in the future, especially those related to the existence of Indonesia as a community of Southeast Asian countries.